WASHINGTON, DC, May 27, 2013 (ENS) – On Wednesday, the day after Ernest Moniz was sworn in as the new U.S. Secretary of Energy, electric automaker Tesla Motors repaid the entire remaining balance on a $465 million loan from the Department of Energy – nine years sooner than required. “The Department first offered loans to Tesla and other auto manufacturers in June 2009, when car companies couldn’t get other financing and many people questioned whether the industry would survive. Today, Tesla employs more than 3,000 American workers and is living proof of the power of American innovation,” said Dr. Moniz. In June 2009, the Energy Department offered more than $8 billion in conditional loan commitments to three companies – Ford, Nissan and Tesla – to help retool, refurbish, and reopen American auto plants to produce the cars of the future. Tesla’s $465 million loan enabled it to reopen a shuttered auto manufacturing plant in Fremont, California and to produce battery packs, electric motors, and other powertrain components. 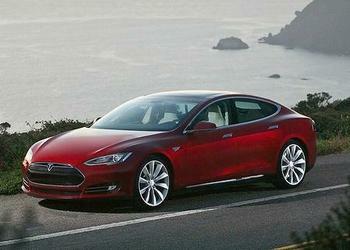 Tesla vehicles have won wide acclaim, including the 2013 Car of the Year from both Motor Trend and Automotive Magazine, and Consumer Reports recently rated Tesla’s Model S as tied for the best car ever rated. Tesla has created more than 3,000 full-time jobs in California and is building out a supply chain that supports numerous additional jobs and technologies and is bringing advanced manufacturing technology back to America, Moniz said. The Energy Department provided a $5.9 billion loan to Ford to upgrade and modernize 13 factories across six states and to introduce new technologies to raise the fuel efficiency of more than a dozen popular vehicles, including C-Max Hybrid, Focus, Escape, Fusion, Taurus, and F-150 trucks, representing approximately two million new vehicles annually. This investment is supporting approximately 33,000 manufacturing and engineering jobs across the United States. In Smyrna, Tennessee, the first advanced battery packs produced in the United States are coming off the production line of Nissan North America’s production plant. These advanced batteries are powering U.S.-made all-electric Nissan LEAF cars. The construction of Nissan’s 1.3-million-square-foot, state of the art battery facility was made possible through a $1.4 billion loan from the Department of Energy. 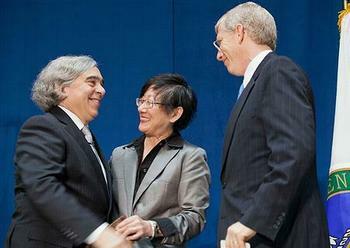 A nuclear physicist, Dr. Moniz is serving his second stint with the Department of Energy, where he served as Under Secretary of Energy from 1997 to 2001 during the Clinton Administration. He comes to the secretary’s office from the Massachusetts Institute of Technology, where he served as the Cecil and Ida Green Professor of Physics and Engineering Systems, Director of the Energy Initiative, and Director of the Laboratory for Energy and the Environment. Moniz called clean energy and climate change his top policy priorities, telling an audience of Energy Department employees on his first day that these issues are “the real driver of my coming back” to the department. “Let me make it very clear that there is no ambiguity in terms of the scientific basis calling for a prudent response on climate change,” he declared. “I am not interested in debating what is not debatable,” he said, citing a recent review of the scientific literature on climate change that found 97 percent of climate scientists agree that climate change is due to human activities.